This detached property is over three floors. 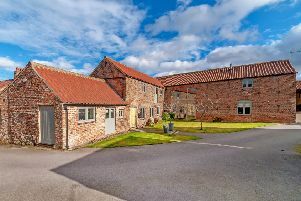 It includes four bedrooms, three reception rooms and two bathrooms in the main house and a separate detached two storey building, suitable for a variety purposes. The separate building is currently divided into garage, utility room/kitchen, store room, office and gym, but could easily be adapted to additional living accommodation for a dependant relative, work from home space, subject to obtaining any necessary consents. Contact Feather Smailes Scales 01423 534183.